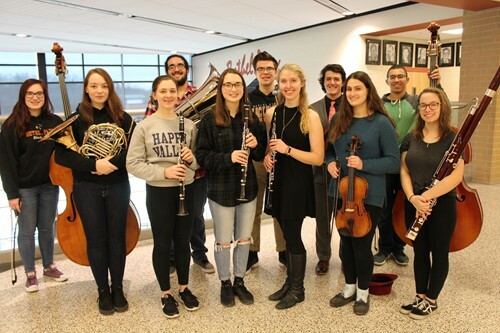 Thirteen Bethel Park High School musicians successfully auditioned and have been selected to perform in the Pennsylvania Music Educators Association’s District Orchestra Concert, which will be held on Saturday, January 12 at North Allegheny High School. Representing Bethel Park in this event will be seniors Sara Bucci (clarinet), Kobe Coleman (bass), Kyleigh Flood (bass), Anthony Lucchitti (percussion), Emma Petrick (clarinet), Connor Remington (tuba), Vincent Vituccio (violin) and Jenelle Wu (violin). Also participating in this concert will be juniors Roma Eisel (bassoon) and Theresa Stolpa (French horn), and sophomores Grace Gealey (viola), Elijah Nice (percussion) and Olivia Tabler (clarinet). The strings musicians are taught by Bethel Park High School Orchestra Director Stephanie Glover and the remaining musicians are taught by Bethel Park High School Band Director Chad Thompson.